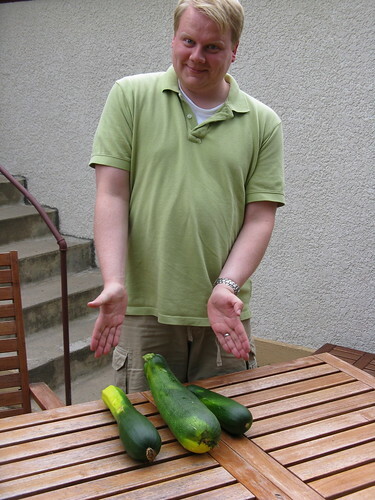 The amount of zucchini that people get in their gardens & through CSAs can sometimes be a little overwhelming. Our garden is just growing them like crazy & we get a handful every other week from Harmony Valley. Since we've been finding all different ways to use them I thought I'd share in one handy post. And later we'll be making Zucchini Stuffed With Chorizo plus canning some Zucchini Relish so watch for those. Still have too much zucchini? Preserve some of it for later. Peel, seed & grate zucchini. Give it a quick blanch in boiling water. Let drain. 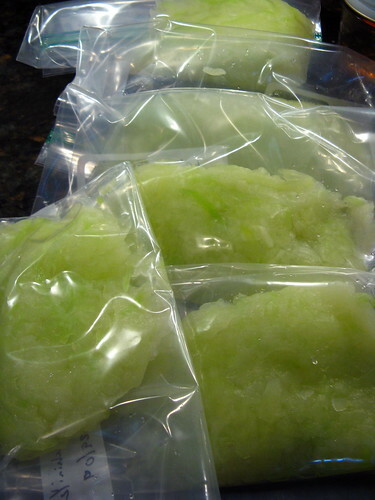 Freeze in small amounts. Use it in muffins quick breads for added moistness or throw it in soups & stews. Or why not make zucchini pickles? Zucchini has the perfect texture for pickles so why not use it instead of cucumbers. These are similar to sweet pickles with a touch of ginger flavor. In a large enamel or stainless steel saucepan combine the water, sugar, vinegar, salt, mustard, turmeric and ginger. Bring to a boil over medium-high heat, stirring to melt the sugar. Add the zucchini & onions. Bring back to a boil & boil for 10 minutes. Pack into five hot sterilized half-pint jars leaving about 1/2-inch headroom. Clean off the tops of the jars & cover with a lid. Close with a neckband & finger-tighten. Process in boiling water for 10 minutes. Turn off heat & let sit for 5 minutes. 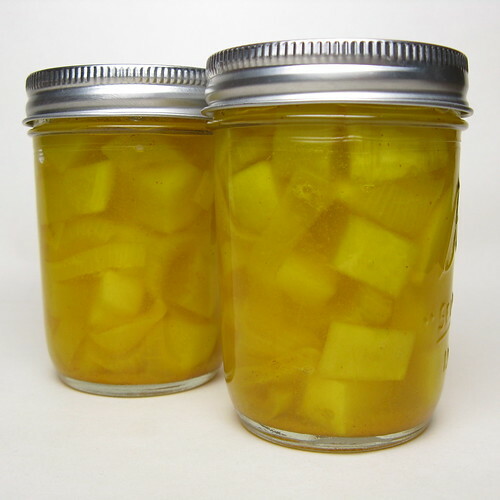 Remove jars from the water to a heat-proof surface & let cool for 12 - 24 hours (do not dry jars). Check to make sure the top of the jar has been drawn downwards, creating a seal. Great looking pickles! I love zucchini, and I love your ideas for using them! pickled squash? what a notion! tis a great use for a behemoth of a zucchini. What a unique use for those gorgeous zucchini!! Never would have thoughtof that! I'll be referring back to this post - as I am getting about 1 - 2 zucchini a day from my garden. Thank you for the list of zucchini recipes. I was just doing a search of zucchini recipes the other day. I just love zucchini. So versatile. It is the absolute best zucchini dish I've ever had. Can you suggest a retail outlet for Crispin in the IC area? What is the unit of measurement of c? Wash & slice zucchini, peel & slice potatoes and boil both in water (with stock cubes) for about 15 mins. Add creme fraiche and herbs and run through blender. Voilà! I just used your recipe to make the zucchini pickles - AMAZING! They're a huge hit! Thanks so much, I'll be coming back to this recipe all summer.